Your vehicle pulls to one side when you press on the brakes. Your brakes require more pressure than normal to stop. At Camarillo Car Care, we understand the importance of your brakes for the safety of you, your family and the public at large. That’s why we have deliberately made many internal decisions that allow us to give your car the best braking ability as possible. 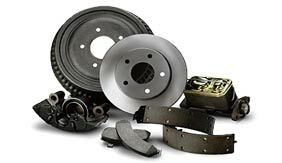 The parts we select for your brake service and repair meet or exceed your car manufacturer’s specifications. In fact, in most cases, we use the exact manufacturer’s part specified. The reason for this is that usually their part is provides the best stopping power and is the safest. We also don’t shave costs by hiring just anyone to do your brake work. Our technicians are qualified ASE Certified or Master technicians. This gives you an eagle eye looking over your car and making the right decisions when it comes to your braking system. One of the best pieces of equipment found in our shop is our “On-the-car-brake-machine.” This equipment allows us to turn the rotors while they remain on the car. This uses the car’s particular characteristics to accurately shape the rotor. For example, if your car has a slight bend in the axle, taking the rotor off the car and turning it on a brake machine would shape it improperly for your car. This could cause premature wear, and brakes that pulsate or pull to one side.